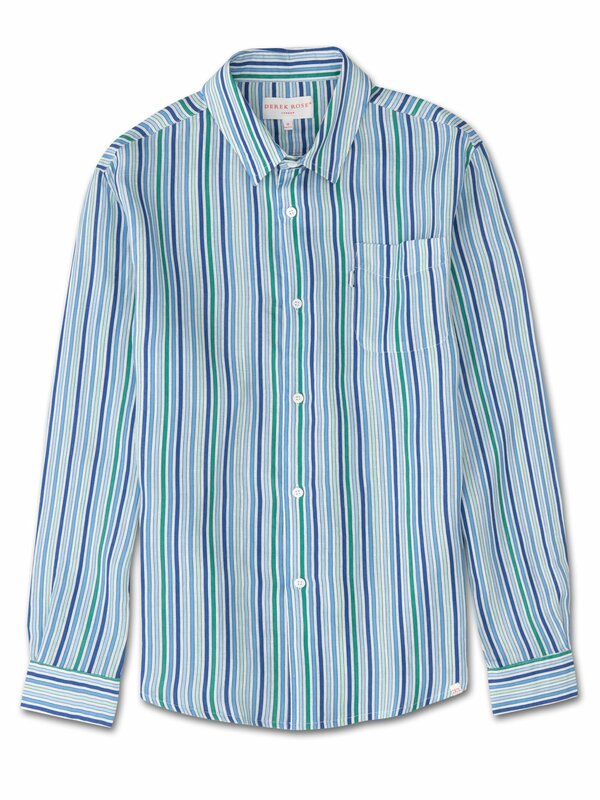 With a nod to our striped pyjama heritage, the Milan 5 shirt features a green, white and multiple blue vertical striped print and is cut for a regular fit for the perfect, warm weather ready style. Designed to keep you cool and comfortable in even the hottest of conditions, we have developed a lightweight, beautifully soft and breathable pure linen. This made in Italy fabric is piece-dyed and printed before construction for a stylish holiday essential. The Milan 5 shirt features a curved back yoke with a box-pleat for comfort and a curved hem with side vents for ease of movement. We've used the classic styling of a button-through front and cuffs, a 2-piece collar and for a modern addition we've added a U-shaped breast pocket with a handy sunglass loop for effortless summer-chic. For a final touch of luxe, the shirt is finished with mother of pearl buttons throughout and our minimalist rose logo label at the hem. There's also a handy 'locker' loop on the back for you to hang your shirt up when changing. Wear the Milan 5 to and from the beach or as a cool, smart-casual shirt for sultry evening walks and dinner by the sea.